, and their potential in regenerative medicine was quickly realized. As banking cord blood was already an established service by the time cord tissue's stem cells were discovered, it was easy for many cord blood banks to also start collecting and preserving the umbilical cord tissue. Cord tissue banking is the service of collecting, preparing and cryo-preserving the cord tissue for potential future therapeutic use. It's important to note that umbilical cord blood and cord tissue are rich in two distinct types of stem cells. Both types of stem cells play key roles in regenerative medicine, and each works in its own way. Read about how cord blood and cord tissue compare. There are many different types of stem cells present in cord tissue, and they all have different potential uses. There are epithelial (ep-i-thee-lee-al) and endothelial (en-do-thee-lee-al) stem cells, but cord tissue is mainly rich in mesenchymal (meh-sen-ki-mal) stem cells, or MSCs. MSCs are the precursors to the cells of the nervous system, sensory organs, circulatory tissues, skin, bone, cartilage and more. MSCs are powerful stem cells that help repair and heal the body in different ways than cord blood. Cord tissue stem cells have many functions including the ability to inhibit inflammation following tissue damage, secrete growth factors that aid in tissue repair and differentiate into many cell types including neural cells, bone cells, fat cells and cartilage. MSCs, as found in cord tissue, are currently being investigated in hundreds of clinical trials. While the research is in its early stages, the possibilities are extremely promising. By banking umbilical cord tissue, parents increase their child's access to these treatments in the future. Read more about treatments using stem cells. How does cord tissue banking work? The cord tissue banking process begins with the procurement of approximately six inches of the umbilical cord at time of birth. This is performed after the placenta has been delivered, the umbilical cord has been cut and the umbilical cord blood has been collected. The segment of the cord is cleansed and placed in a container containing antibiotics for transportation to the laboratory. 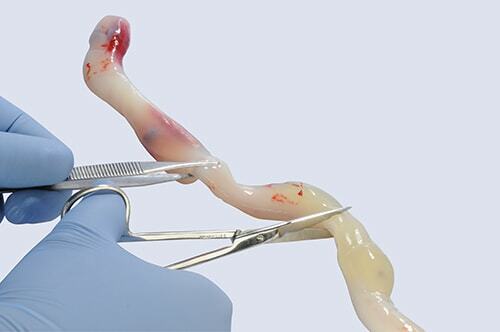 The cord tissue collection is safe and may be performed in both vaginal and cesarean-section (C-section) births. The container will be transported along with the cord blood for immediate processing at the cord blood laboratory. At Cryo-Cell International, cord tissue is cryo-preserved in its natural environment. If needed, the stem cells are then extracted immediately before their expected use. This provides the most flexibility for the future use of cells found in the cord tissue. Other cord blood banks extract the stem cells from the tissue through enzymatic digestion before cryo-preservation.43 By waiting to extract the stem cells, our method preserves multiple cell types that may be beneficial in future cell therapies for your baby and family. The cryo-preservation processing method used by Cryo-Cell International has been independently acknowledged as the best. According to scientific data published in the October 2015 issue of Placenta, cord tissue that has undergone minimal manipulation "appears to be the optimal solution for umbilical cord tissue MSCs storage for future clinical use because the cryo-preservation of the previously isolated and expanded cells using unstandardized protocols can be considered non-compliant in relation to future accepted standards." Cord tissue undergoes minimal manipulaton prior to storage Preserves multiple cell types for potential future therapies including mesenchymal stem cells, endothelial cells, perivascular cells, growth factors & proteins, and epithelial cells. Cord tissue is processed post-preservation Provides the best possible chance the cord tissue stem cells will be acceptable if needed for a wide range of treatments and clinical applications. Leaves the opportunity for the processing method to comply with any future FDA guidelines. Cord tissue is stored in up to 6 vials Allows the potential for multiple therapeutic treatments, and samples can be thawed independently at different times. Why should I bank cord tissue and cord blood? As the future potential uses of MSCs and other cord tissue cells increase, so, too, does the number of families preserving both cord blood and cord tissue. Umbilical cord tissue banking is now commonplace, with over 60 percent of Cryo-Cell’s customers electing to store both their babies' cord blood and their babies' cord tissue. Read more about why you should bank cord blood and cord tissue. Want to learn more? We are here to answer any question you may have and can send you any information about cord tissue banking that you need.